Turn the role-play area into a ‘home setting’. Include a kitchenette with commercial or child-made appliances such as a cooker, microwave, refrigerator and sink. 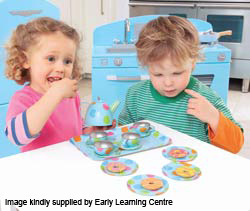 Provide toy utensils such as plates, cups and spoons. Set up a low-level table and chairs and provide decorative items such as tablecloths, plastic vases and pretend flowers. Use a bookcase or shelf for the children to store cookery books, family photo frames and household ‘knick-knacks’ such as keys, pens and pretend bills. Hang framed pictures or the children’s paintings on the walls. Encourage the children to take turns to act out the role of different characters within a home such as mum, dad, brothers and sisters. Make sure that all the children are included and be sensitive to the needs and experiences of individuals who may not live with their birth parents. Development matters: use one-handed tools and equipment (30-50 months); begin to form recognisable letters (40-60 months). Early learning goal: children use their phonic knowledge to write words in ways which match their spoken sounds. They also write some irregular common words. They write simple sentences which can be read by themselves and others. Some words are spelt correctly and others are phonetically plausible.